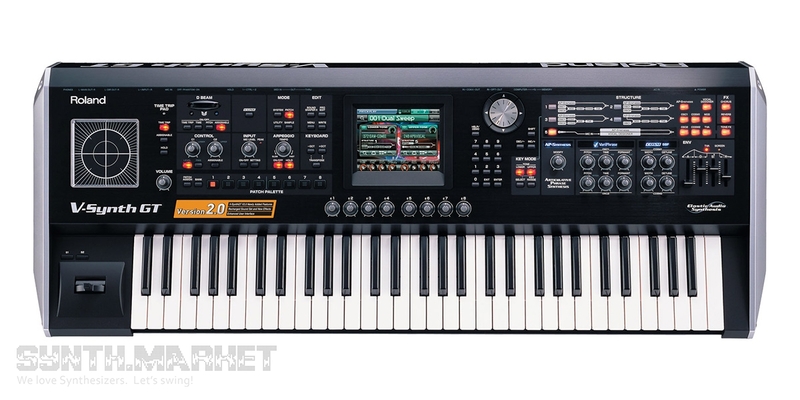 V-Synth GT is the kind of a synthesizer which makes you think that you should’ve thought before, because if you didn’t buy it when it was released you’ll find the today’s prices insane. 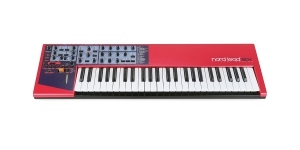 The elder brother of V-Synth is on sale from time to time, and V-Synth GT is extremely rare and is sold straight away – no one looks at the cost. 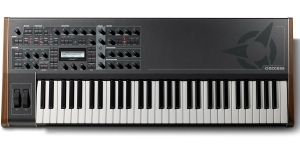 Roland doesn’t produce such synthesizers anymore. Such – meaning such multifunctional and assembled with such a quality. 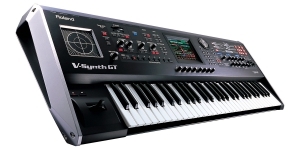 V-Synth GT is an analogue modeling synthesizer of a very high class that produces stunning realistic sounds thanks to Elastic Audio Synthesis, COSM, Vocal Designer and AP (Articulative Phrase) Synthesis technologies. 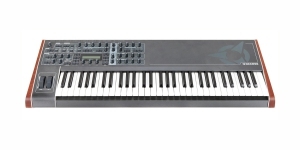 The synthesizer has up to 28 virtual voices, 2 oscillators per voice and 14 available waveforms, including specific ones, has a 16-part multitimbrality, but only 1 part is available via MIDI. Generated sounds are stored in the patch (512) and tone (896, the tones can be bi-timbral) memory. There is 64 MB of memory for waveforms. 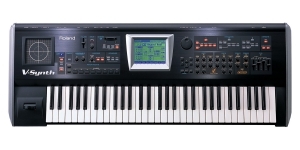 There is also a 44.1kHz/16bit sampler, although the digital outputs and inputs support 48 or 96kHz/24bit. By the way, internal audio processing by sound engine is performed with an unsurpassed accuracy - 32 bit floating point. The ADC and DAC convert with a 24 bit resolution, which is also quite enough even 10 years after V-Synth GT was released. As for the effects, chorus (8 types), reverberation (18 types), 63 kinds of effects for tones, 27 new kinds of effects appeared in the firmware of the second version, a 4-band equalizer is available as well. 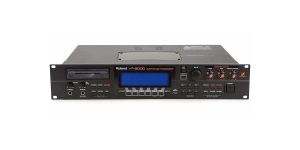 Of course, there is a powerful arpeggiator, extensive modulation capabilities, and external audio processing, but it's better to see more about the capabilities - listen to the videos and read the user's manual. 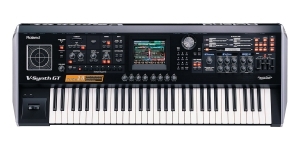 As for the interface, the lucky owner of this super-machine has or will have a graphic touch screen with a 320x240 pixel resolution, a 5-octave keyboard with aftertouch (monophonic), an azimuth touch controller, a brand patented D-beam controller, a combined pitch-bend + modulation controller and encoders with buttons for all the main functions (by the way, the total number of them is smaller than that featured by V-Synth). 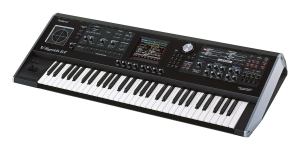 V-Synth GT has a large number of audio outputs and inputs, including digital optical and coaxial, 3 pedal outputs (Hold and two for assignable ones), MIDI IN/OUT/THRU, USB ports for the computer and for the drive. 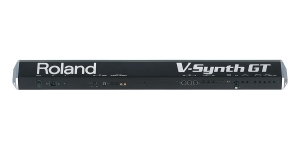 Like its older brother, GT has a V-link function for synchronizing its audio signal with an external video signal, which requires an external workstation Roland/Edirol DV-7PR video engineer. 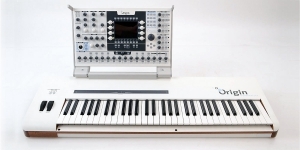 The width of the synthesizer is about a meter, its weight - 14kg, which is not so much, given the metal housing and loads of functions. 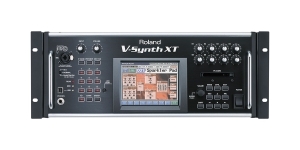 Among the famous musicians who used V-Synth line, it is worth noting the big fan of Roland Nick Rhodes (Duran Duran), as well as BT and Orbital. 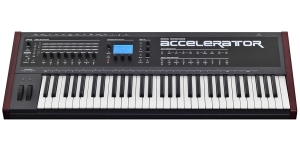 Synthesizer, Performance Synthesizer, Virtual Analog (VA), Voices: 20, Multi Timbral Capacity: 4 part(s), Oscillators per voice: 2, Aftertouch, Velocity Sensitivity, Number of Keys: 49, Size: 4, Production start: 2003.